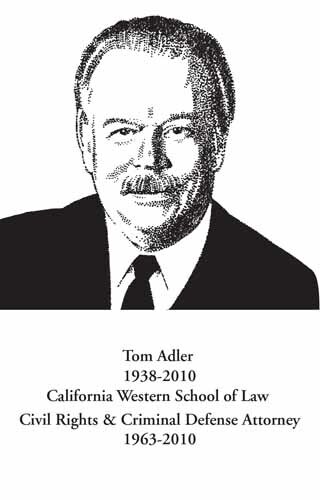 Tom Adler was a noted civil rights and criminal defense lawyer who took on causes in the criminal justice system and the community well beyond his own clients. If he saw injustice, he took action to make it right and was known for his work taking hard to win cases. He began his career doing criminal defense before moving into civil litigation involving police misconduct, sexual harassment, Medi-Cal fraud and employment related matters. He was an avid educator and mentor and was an adjunct professor at the University of San Diego School of Law, as well as a lecturer and panelist for the State Bar of California and San Diego County Bar Association’s continuing legal education programs. When forced to retire from trial practice due to Parkinson’s Disease, Mr. Adler remained active first as a mediator and arbitrator, and later as a social activist, musician, artist and philanthropist. Mr. Adler was a founding member of the Criminal Defense Bar Association of San Diego where he served as its president from 1979 – 1982, as well a long time member of the Criminal Defense Lawyers Club of San Diego where he served as president in 1990. He also served on the Board of Governors and its Executive Committee from 1983 – 1990. Born in Vienna during the beginning of its Nazi occupation, he worked to recover family assets stolen by the Nazis. His investigation culminated in writing the book Lost to the World and successfully recovering a manuscript given as a gift by Gustav Mahler to his grandfather Guido Adler, the founder of the science of musicology. Mr. Adler’s community commitment extended into philanthropy and, among other efforts, he founded the Adler Institute for an Open Democracy and sponsored the Guido Adler Piano Jazz Competition for high school students statewide. And he was a great one for keeping in touch. Every year, he hosted a gathering of his former law clerks at his home and each month would join a handful of them for lunch at a restaurant. When his health declined, they would come to him for visits that lasted hours.